Sanofi US has introduced a new epinephrine injector (competitor to the more commonly known EpiPen made by Dey Pharma LP) that is equipped with audio and visual cues that helps a patient or care-giver administer epinephrine in cases of a severe allergic reaction (anaphylaxis). 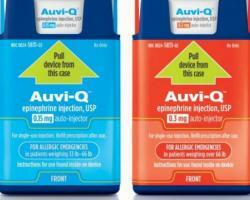 Known as Auvi-Q, it was FDA approved Aug 13, 2012, and should soon become available for purchase by prescription. Just like EpiPen, Auvi-Q comes in two different dosages of epinephrine... 0.3mg for patients who weigh more than 66 pounds and 0.15mg for those who weigh between 33 and 66 pounds. Each pack contains two devices with active drug plus a non-active training device. During a life-threatening allergic reaction, Auvi-Q talks the patient or care-giver through each step of the injection process. If more time is needed, it can repeat the instructions step-by-step. The device also comes with written instructions printed on the side. In addition, there are visual cues with an alert light to signal when the injection is complete. Watch video. Auvi-Q is about the size and shape of a credit card, the thickness of a cell phone and fits comfortably in a pocket or small purse. This size and shape is in contrast to the EpiPen which looks like a fat marker. Being compact and easy to carry should remove one obstacle that could be a reason why as many as two-thirds of patients do not carry their epinephrine injector device. Like the EpiPen, the device also has an automatic retractable needle mechanism to prevent accidental needle sticks.